The Yūkarigaoka Line (ユーカリが丘線, Yūkarigaoka Sen) is a Japanese people mover of Yamaman Co., Ltd., the developer of Yūkarigaoka town. 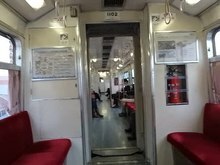 The line, which opened in two stages between November 2, 1982 and September 22, 1983, runs from Yūkarigaoka Station and the entire route is in Sakura, Chiba. The line takes a racket-shaped route as shown in the route diagram. All trains stop at all stations, go through the direction as listed below. Connection to other line is only at Yūkarigaoka Station to Keisei Electric Railway Main Line.